Baking, crafting, collecting & much more were written about on the blog this past May. It’s always so much fun coming up with new recipes & stories to share with all of you, and if you must know, there is never just one source of inspiration for me. I’m constantly looking out for things that catch my attention, whether they be recipes, crafts or items to collect. 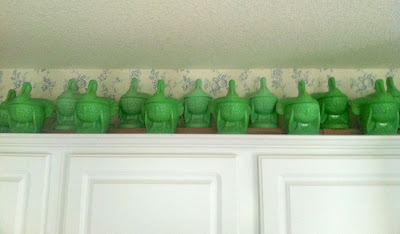 Speaking of collecting, the jadeite story I put together with the help of a few friends was certainly a pleasure, because I was able to see just how passionate people can be about having nice collectibles in their homes. It’s so nice to find collectors using their possesions in their day to day lives. I’m of that ilk that firmly believes collections should be admired and used whenever possible. The Martha by Mail Danish Fern pattern of earthenware was another story I fell in love with. I can only say that I regret not getting that particular Burleigh ware china when it was readily available. Transferware in any color & style, to my mind, is so beautiful to have and set a table with. I hope everyone sent a special card for Mother’s Day this month. 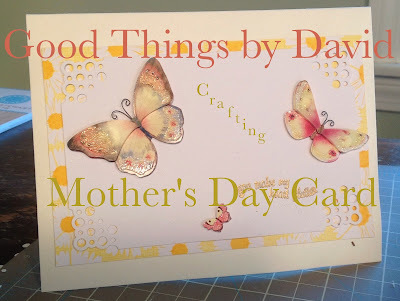 Take the ideas from this month's craft and use them for a birthday card in the future. I think I'm going to start crafting myself! Vanilla Cupcakes & Red Velvet Cupcakes were delectable recipes I touched upon toward the beginning of the month. You must try them if you want tasty, tender and light cupcakes. Lemon madeleines are delicacies I like to indulge in every once in awhile. I don’t know about you, but I can eat several of them in one sitting and not even think twice! Perfect with a cup of tea. If you’re having a wedding coming up soon and would like ideas for favors & cakes, go through the lovely Martha by Mail collectible cookie cutters I featured and the Vintage Wedding Cakes I displayed for you. Going retro can be a lot of fun, so if you’re so inclined, make your special day a memorable one with a nod to the past. Mmmmmm, yum. Madeleines are always welcomed with a cup of tea. I find that I adore them the next day even more than right when they come out of the oven. I’m not sure that they even stale one bit if I keep them in an airtight container overnight. However, if you insist on having them right out of the oven, knock yourself out. The batter can be kept in the refrigerator for up to one day. A great thing if you’re entertaining a discerning crowd of gourmands. If I see an adult devouring one of these cupcakes in two seconds then I know I’ve provided them with a tasty cupcake. Kids adore red velvet cupcakes because they are such a sight to behold. I think you should make these for a weekend barbecue this summer if you want to please your loved ones. They would be perfect for a 4th of July celebration with family members. For a red, white & blue theme, add blue sprinkles to the tops of each cupcake after they’ve been iced with some vanilla frosting. Trust me, there won’t be one left. Ah, dogwoods. Where would I be without the lovely sight of these trees? I will forever be an admirer of dogwood trees, whether they be small, young ones or large, mature beauties that tower up to 40 feet in the air if they're given shade (about 20 feet in full sun). You should plant one in your yard if you don’t already possess a dogwood tree. You’ll be rewarded with years of gorgeous blooms in May. Heat embossing a card is such a nice way to add a bit of elegance to any card. 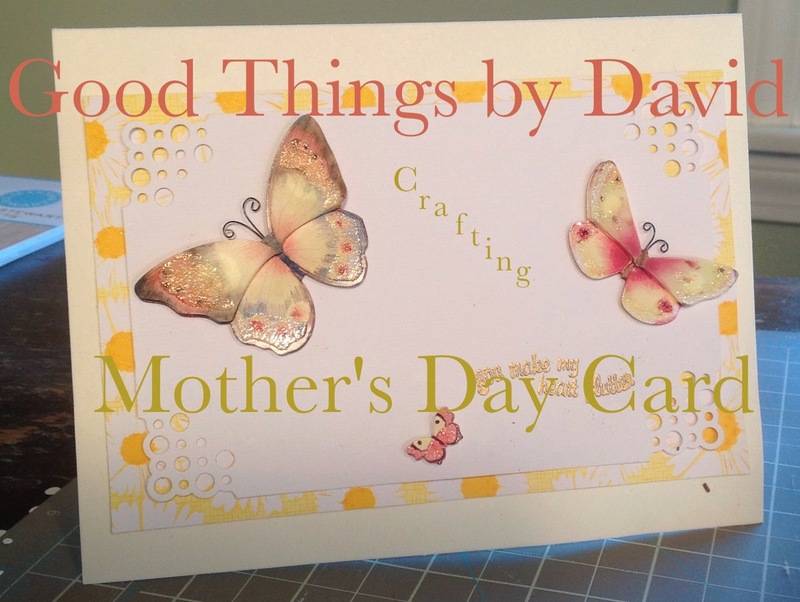 With embossing powders, stamps and a heat gun, you can easily make a number of designs for one-of-a-kind cards. FYI, I recently ‘discovered’ a wonderful store called Paper-Source near my home. They have everything for this kind of project! If you live near one, visit it and get inspired to create something nice. The second lucky winner of that cookie contest received her cookies on time for Mother’s Day and she was certainly pleased to have them. Unbeknownst to her, I sent an extra box of cookies as a surprise! It’s so beautiful to go back and see this lovely china. Thanks to my friend, Alan, I was able to show you up close just how exquisite the transferware is. Alan is determined to add a lot more to his collection and I’m sure he’ll be successful in locating just what he wants. Best to you Alan! Keep this recipe close at hand because it is wonderful. It’s a go-to cupcake that is always a crowd pleaser and for you, the baker, it’s great that the recipe is so easy to make. Get creative with the cupcakes and add citrus zest to the batter to perk them up or frost them with a favorite icing of yours if you don’t want vanilla. If you own the Beautiful Bug Cookie Cutters, I hope they prompt you to throw a party out in your garden and have them as part of the celebration. Pile them up on a platters or cake stands if you wish. You can also wrap them up in cellophane bags to give away. So pretty. So Martha. Who doesn’t love a bit of retro every now and then? Wilton Wedding Cakes are classics. What I love about these vintage cakes is the piping detail on every single layer. Everything was very orderly and meticulous in those days, with clearly defined lines between the stacked layers. The embellishments were another nice way to add a bit of whimsy to the confections. Just looking at them brings back so many memories for me from childhood. Oh dear. Writing this post just made me want to hit every antique shop in the area and buy up the glassware from the 30s, 40s and 50s in great quantities. 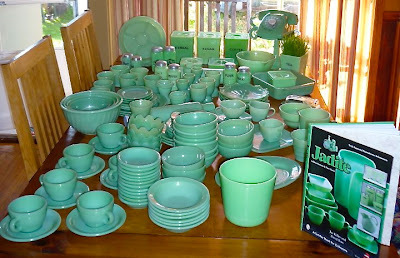 It is clear that people are passionate about jadeite. The way my friends have managed to make their beautiful possessions a part of their daily lives is amazing. Nick’s Jeanette canisters are items I truly covet. It’s so nice to see his filled with their designated items on his kitchen counter. Did you notice the jadeite-colored rotary telephone? Go back and look for it. Clay & George certainly have a wonderful home. To have that chandelier gracing the dining room would be a dream come true for anyone! 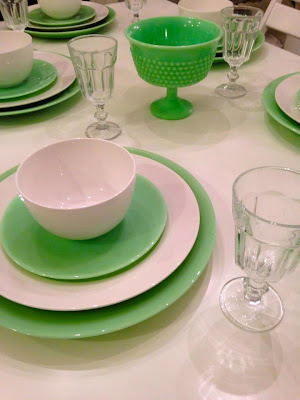 I love the way they mix the jadeite with their china for a table setting, because that’s exactly what I do with mine here at home. Personally, I like the combination of jadeite and Wedgwood Queen’s Ware (traditional plain) & White Bone China. The creamy colors pair nicely with the milky green hue of jadeite. 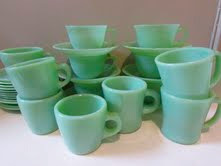 Matt’s beautiful collection of jadeite is used all the time, I can assure you. 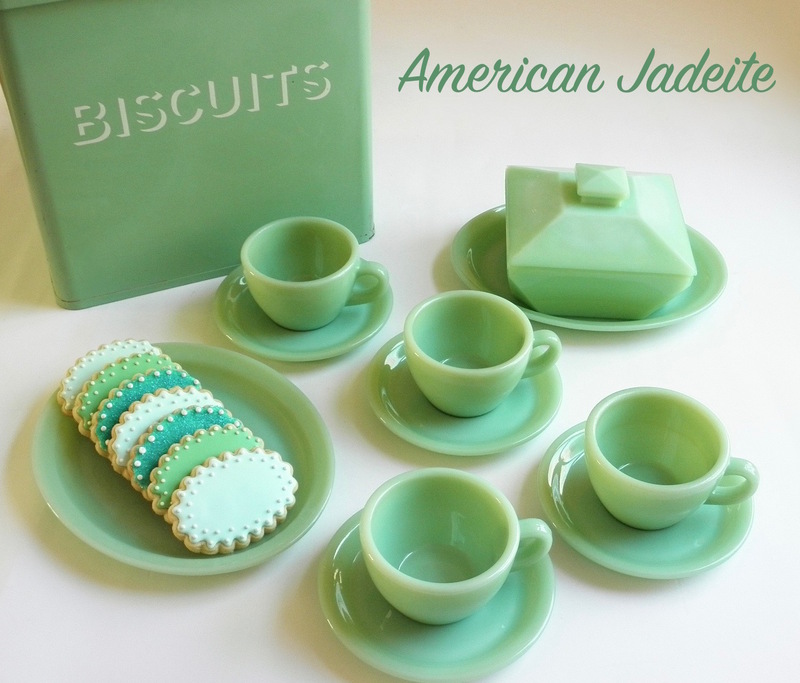 He doesn’t mind having an every day meal or preparing a recipe using his best jadeite. The way he displays it in the kitchen cabinets is a testament to his style of good living. Visit his blog by clicking here and see what he’s up to. I think there is a garden in the works! I can’t get enough of this vinaigrette. Over the Memorial Day weekend I used it to marinate some turkey cutlets for grilling and the results were spectacular. The flavor and subtle hints of the fresh herbs penetrated the turkey perfectly. Keep it in your refrigerator for a flavorful boost in your salads. I know you’re going to like it. While going through the Bell & Dove images of these Martha by Mail cookie cutters, I realized I had no idea what the parts of a bell were (I had to look them up!). If you make Bell & Dove cookies for wedding favors, everyone will be talking about them. I love how the former catalog showed us a great display on stacked cake stands. Martha by Mail items are so collectible. What does June have in store? I’m thinking of a good cookie recipe, some tasty granola, a bit of collecting (Wedgwood is due for a write up) and a homekeeping tip or two that I’ve been meaning to get to--I’m even going to craft for you! Stay tuned for more Good Things this coming month. I think you’re going to like them. Sweet copper cookie cutters produced for Martha by Mail in the shapes of a Bell & Dove, can be used to bake exquisite cookies for any wedding. Made by a talented American coppersmith over a decade ago, the delightful duo of 4-inch cookie cutters are now collector’s items that every owner should cherish & use. Give your good friends, family members or loved ones the gift of hand made cookies for their big day using these open back cutters. Bake large batches of butter cookies, chocolate cookies or whatever flavor they like, and ice them in shades pertaining to the theme of the event. Although cookie favors are customary for weddings, why not make a few for a shower or a special dinner? Packed into clear cellophane bags or boxes and tied with ribbons, the favors will undoubtedly become the topic of conversation. 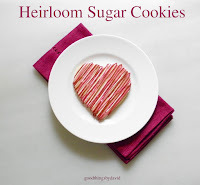 Revisit these wonderful images from Martha by Mail and get inspired to create beautiful cookies this spring, summer, fall or winter. A tower of cake stands with Bell & Dove cookies. The bell on the left was flooded in white royal icing. Light blue royal icing was piped on the bell's crown and underneath, for the clapper. A light blue band is piped across for the bead line. This floodwork is left to dry. Pipe a bead of royal icing for the border around the bell and around the bead line, then pipe dots throughout the waist of the bell; flock with fine sanding sugar. When dry, tap off excess sugar. This beautiful dove is flooded in light blue royal icing. When dry it is given white flourishes along the wings and tail to suggest flight. Pipe a dot for an eye. A whimsical bell is flooded in light green royal icing. The clapper is simple white royal icing. Once the floodwork is dry, pipe a white royal icing trellis using a #2 piping tip. Let dry. The cookie is packaged in a clear cellophane bag and tied with some seam binding ribbon. The white dove is flooded in white royal icing and is flocked in fine sanding sugar while still wet. A dragee is used for an eye. This simple bell is flooded in light blue royal icing. Once dry, a bead of icing is piped along the border, which is flocked in fine sanding sugar. The bead line is decorated with silver dragees. For the clapper, attach a large silver dragee with some royal icing. Leave to dry. The base of this dessert display is an etched mirror which is covered in iced sugar cookies. Clear cake stands are stacked for a dramatic presentation. Beautifully iced doves are placed along the bottom tier while bells are placed on the middle tier. The top tier is decorated with irises resting in small vases. A single white dove is placed in the middle. Everyone who likes to eat fresh salads at home, and I hope all of you do, should have a good vinaigrette recipe that is flavorful & easy to make. I enjoy all sorts of vinaigrettes for my daily salads made with sherry, balsamic, white wine, red wine or champagne vinegars. Normally we tend to stick with a basic balsamic vinaigrette for everyday eating, but for those days when I want a bit more depth, a bit more flavor and some extra zip, I make a red wine version that I fell in love with at a local eatery. I asked the chef to share the recipe with me, but instead of giving me the actual proportions, he simply gave me the breakdown of ingredients. Not one to be daunted by something as simple as salad dressing, I went home and began to experiment with ratios. This recipe is so easy and so delicious, that I highly recommend you try it at home soon. Perfect for those weekday dinners in which salads should play a role, you will find yourself wanting to make it time and time again. It has several ingredients, including fresh herbs that you can pick from your garden or herb pots (or buy at the store). Each ingredient is essential in making this perfect vinaigrette so don’t leave anything out. Make some to have with your salad for dinner tonight or use it to marinate some chicken cutlets or other savory meat for grilling. Enjoy! Yield: between 1/3 to 1/2 cup vinaigrette. Enough for 4-6 salad portions. Note: The recipe can be multiplied many times over. In a blender (the chef recommends using a Vitamix) or a small food processor, blend all of the ingredients (salt & pepper to taste) until you create a creamy emulsion and the ingredients are smoothly combined. Taste for salt and pepper and adjust it accordingly. The vinaigrette will keep in the refrigerator for up to 3 days. Here is a light lunch or dinner. Serve grilled turkey tenderloin that's thinly sliced, a mesclun of baby greens & sliced avocado drizzled lightly with my vinaigrette. 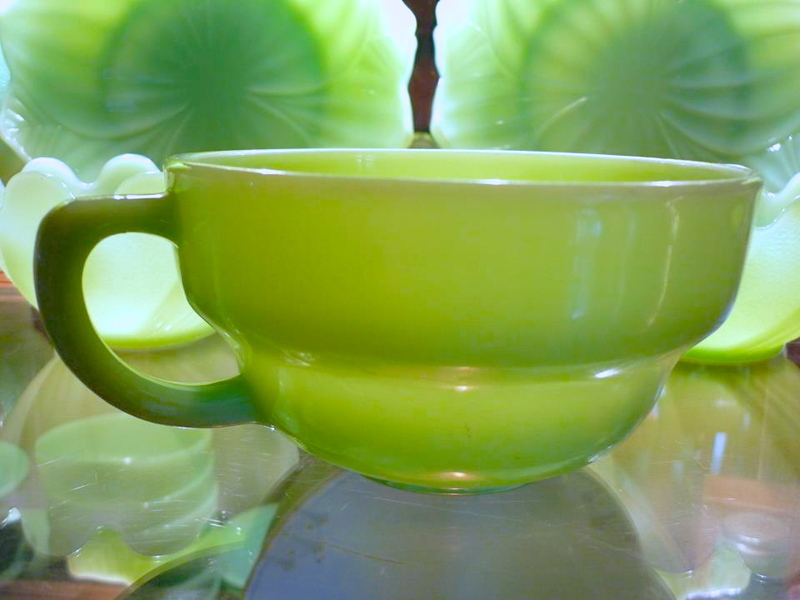 With its origins dating back to the 1930s, jadeite glassware began its mass production through the McKee Glass Co. in Pennsylvania. 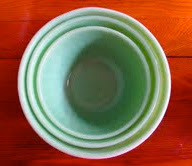 Their introduction of the Skokie green & Jade kitchenware lines ushered in our fascination with this jade color. 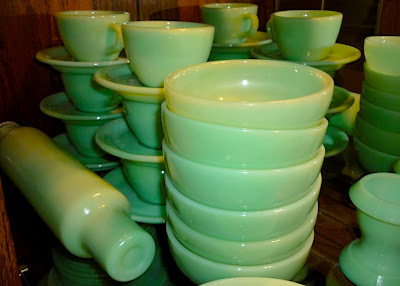 Glassmakers catered jadeite to the American public as an inexpensive alternative to earthenware soon after the Depression, both for the home and for its use in restaurants. The Jeanette Glass Company and Anchor Hocking introduced their own patterns and styles, which for many collectors, produced some of the most sought after pieces. Companies marketed this beautiful glass under the monikers of jadite, jadeite, jade glass, jad-ite, jade-ite, so however you want to spell it, let it draw you in for a closer look. 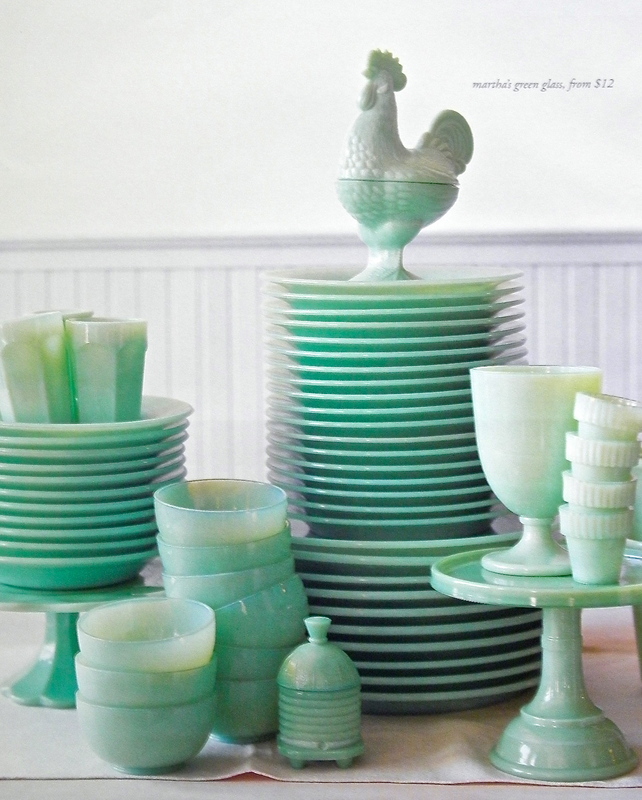 If you want a thorough history of the origins of jadeite, collectors’ pricing, patterns & shapes (don’t forget the reproductions in 2000), I highly suggest picking up the book by Joe Keller & David Ross called, Jadeite: An Identification & Price Guide. From the private collection of Nick Stein. Collecting jadeite is a passion for many. People adore the soft green hue of this glass to no end and are devoted to collecting it for their homes. 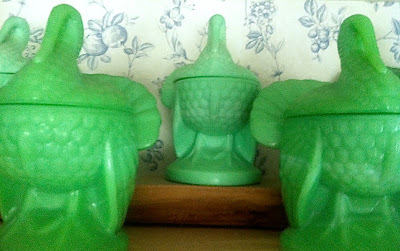 There are collectors who will tell you that they only collect one pattern of jadeite and are dedicated to getting as much of it as they can. Then there are those of us who don’t mind having a mix of patterns & styles or even a mix of old & new. From the private collection of Clay & George. I happen to love it because green has always been my favorite color, and because I love the way it looks in my kitchen & on my dining table. My only problem is that I don’t allocate more time & energy into collecting jadeite the way I should. I do own several pieces, both vintage Fire King & Martha by Mail reproductions that I adore and use on a monthly basis, but really & truly, I wish I had a whole kitchen stocked with this wonderful glass like some of my friends do. Whether you collect it by the dozens or own a few pieces that you cherish, jadeite is forever woven into the fabric of this country. Martha Stewart's Westport Television Studios. 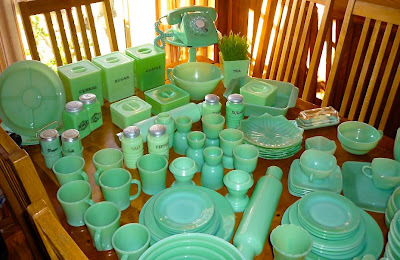 One cannot talk about jadeite, of course, without mentioning Martha Stewart. It was because of Martha’s passion for this glassware that many of us were reminded and reintroduced to its many beautiful qualities. Gracing her former Westport Television Studios, the glassware became a fixture on many programs and in her magazine throughout the years. People took note. With her commissions from several glassmakers (Fenton, & L.E. 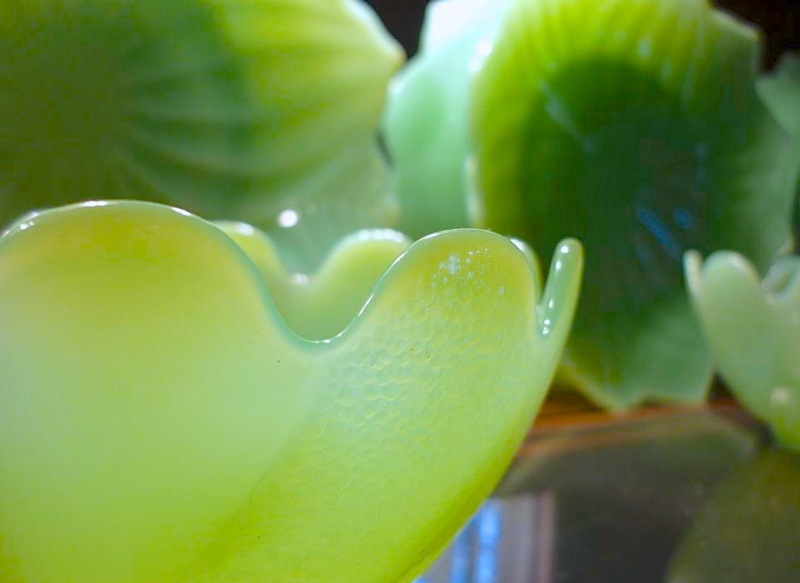 Smith) to reproduce certain pieces for Martha by Mail, many of us were able to begin our contemporary collections of this beautiful green glass. Incidentally, the former catalog marketed the glass as “Martha’s Green Glass”. It’s no surprise that a few of my friends have begun their collections as a result of this and, if you must know, they have become formidable collectors. 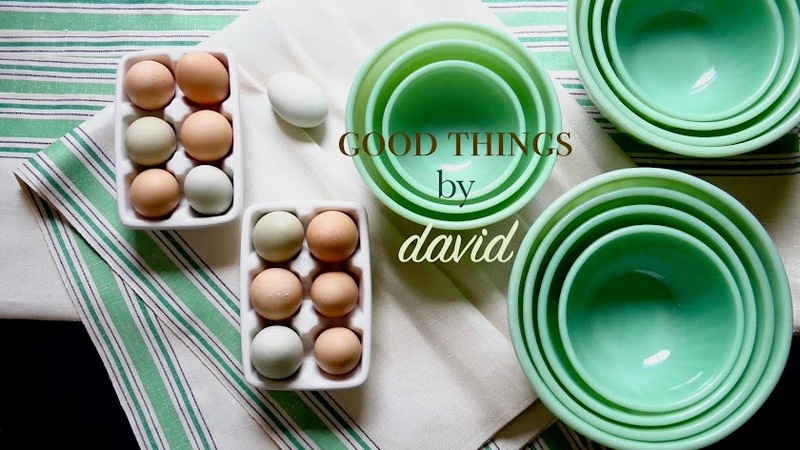 I recently asked some of them if they would supply me with a few photographs of their beautiful collections for Good Things by David, and naturally, they agreed. Thank You, Clay, George, Nick & Matt for contributing your images and allowing us to enter your homes here on the blog. 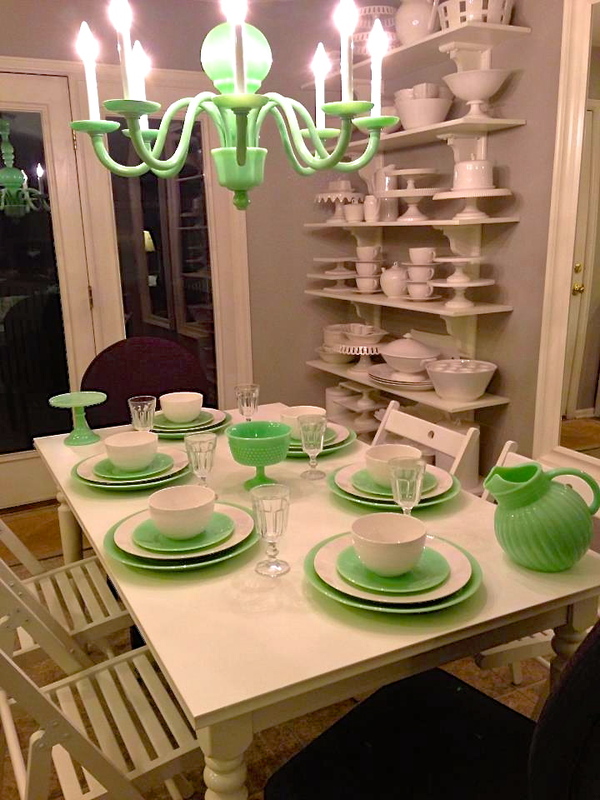 It’s so nice to find like-minded individuals who share a passion for collecting, and who mix & match the vintage jadeite with the contemporary jadeite in their everyday lives. Clay & George are two good friends of mine who reside in Colorado. 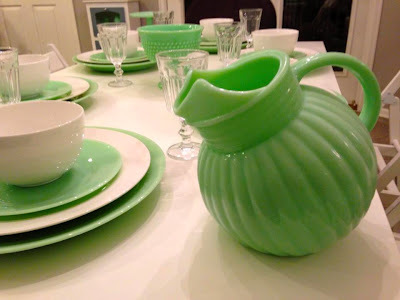 Their home is devoted to nothing but good things, and it is because of this that I asked them to share some of their jadeite collection with us. "I'm pretty sure the jug (or jugs, I have two) are reproductions. They're not stamped underneath, and although I suppose it's possible that I stumbled upon a treasure, it's unlikely. Though I love them just the same." I asked Clay how he started collecting this glassware. Mixing & matching jadeite with fine china. My friend Nick Stein is a college student in California who is amassing a large collection of jadeite. It's astonishing to see how passionate he is about collecting. Have a look at his treasured glassware. 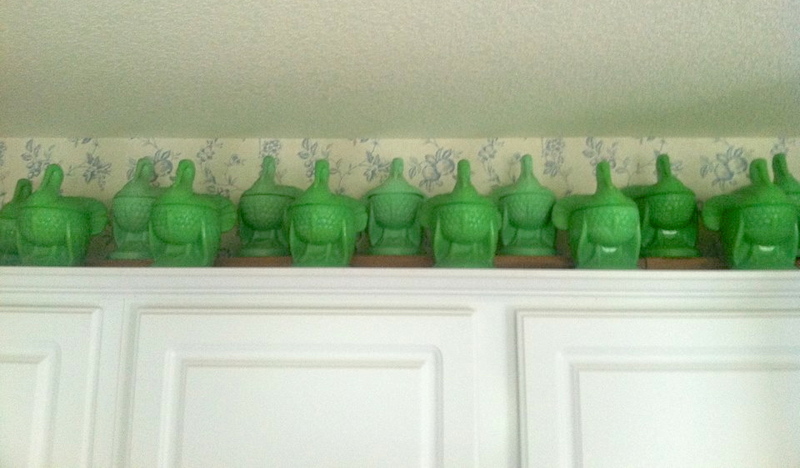 "My jadeite collection is a little over two years old. Like many collectors out there, Martha was the reason I began this insatiable hunt for green glass. Seeing her collections in the Westport studio cabinets and old editions of Living magazine (Spring '92 especially) really inspired me. Once I had one piece I became obsessed! I love how functional it is and yet it retains that vintage beauty of simpler times. Since then I have collected pieces from many sources, friends gave me some they had in their homes for decades and I bought many from antique stores and garage sales!" "My #1 favorite piece is the handled soup cup. It is exceptionally rare and was given to me selflessly by a very dear friend. I've never seen another one like it, and the Keller/Ross jadeite guide book values it at nearly $1,000. Imagine! It's such a humble and unique piece and I know I will always treasure it." "I definitely display my jadeite proudly, but using it is most fun for me. As you can see in these photos, I use them to hold many things. Oats, my favorite brand of teas, fresh coffee and sugar which I use every day!" "These canisters are some of the older jadeite out there. The square ones were made by the Jeannette company in the 30's and 40's. 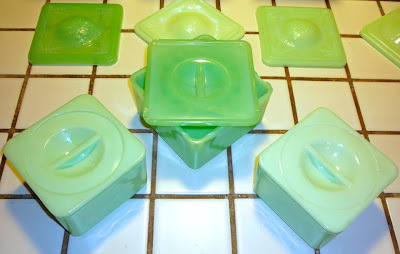 Like most jadeite, they all vary in color and mold imperfections, but I think this just adds so much to the appeal, every piece is unique! The large canisters are 48oz and came in Coffee, Sugar, Flour, Tea, Salt, and Cereal. The flour and salt canisters are exceptionally rare and I've never seen one of either. The large lids feature a pretty flower pattern on the underside of the lids, a fact which Martha herself hadn't even noticed until talking to a collector named David Ross (click here for a video) The smaller tall canisters are 29oz and came in Flour, Coffee, Tea and Cereal." Matt Gallaway is another friend of mine who blogs about "Good Things" in his spare time. He has been collecting jadeite for a number of years and loves to use it on a weekly basis. 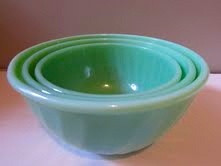 "The swirl bowls in these pictures I use all the time, and were one of my first purchases. I was inspired to start collecting by Martha, of course. I had a bit of a retro vibe going on in my early decorating days, and jadeite fit right in...and it was still inexpensive! I could still even find things at thrift stores for a quarter in the mid to late nineties." "The cups and coffee mugs and saucers (the most plentiful thing in the world, and always inexpensive since people don't want a saucer without a cup. I use them for dessert plates) and most of the bowls and lunch and dinner plates I have are all considered Restaurant Ware." "That last little cup and swirl saucer is my favorite, although I think they are a married pair and not original together." 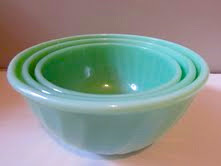 "The swirl vegetable bowl was the very first thing I ever purchased that was jadeite, from a church thrift shop. There is a pencil mark on it that I have never been able to get off." "The ashtray is one of the last things I've purchased. I just thought it was so strange, yet so "1950's kitchen table". I used it to hold ground pepper on a table once to see if people would think it was full of ashes." 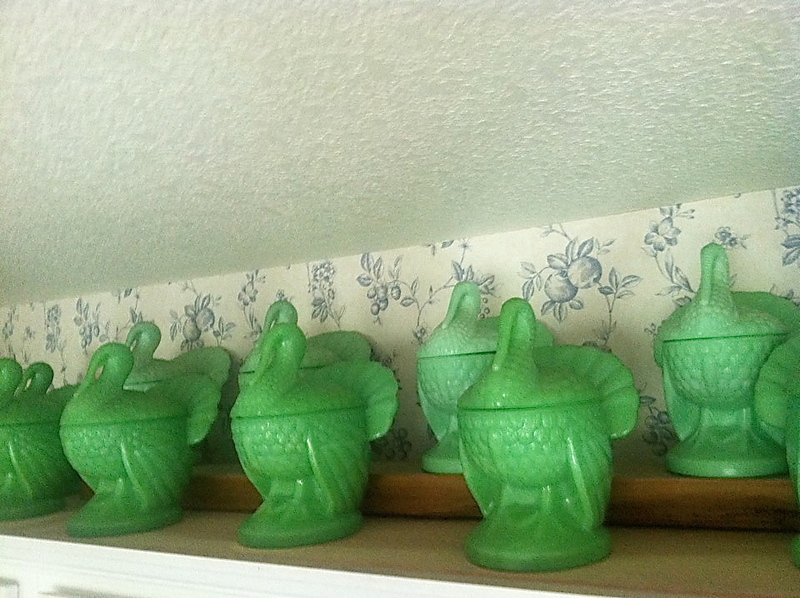 My friend, David Bondarchuck, had told me awhile back that he had a set of 14 Martha by Mail jadeite turkey dishes at home. Naturally I wanted images of them and I finally have some to share with you! David keeps these jadeite turkeys on top of his kitchen cabinets. A small army of turkeys. When Martha by Mail was selling "Martha's Green Glass", the jadeite turkey played a prominent role in their catalog & online advertising. It's wonderful that David managed to acquire a collection of them. You can see the variations in color from turkey to turkey. The ones in the front have a deeper jade tone to them, as opposed to the ones in the back which have a softer green shade. 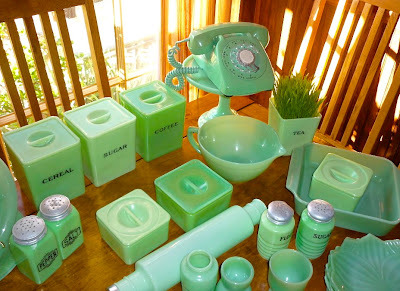 A nice collection of Martha by Mail jadeite. Thank You David! !